For other uses, see Ericsson (disambiguation). Ericsson (Telefonaktiebolaget L. M. Ericsson) is a Swedish multinational networking and telecommunications company headquartered in Stockholm. The company offers services, software and infrastructure in information and communications technology for telecommunications operators, traditional telecommunications and Internet Protocol (IP) networking equipment, mobile and fixed broadband, operations and business support services, cable television, IPTV, video systems, and an extensive services operation. Ericsson had 35% market share in the 2G/3G/4G mobile network infrastructure market in 2012. The company was founded in 1876 by Lars Magnus Ericsson; as of 2016[update] it is headquartered in Stockholm, Sweden. The company employs around 95,000 people and operates in around 180 countries. Ericsson holds over 42,000 granted patents as of December 2016, including many in wireless communications. 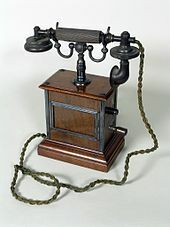 Lars Magnus Ericsson began his association with telephones in his youth as an instrument maker. He worked for a firm that made telegraph equipment for the Swedish government agency Telegrafverket. In 1876, at the age of 30, he started a telegraph repair shop with help from his friend Carl Johan Andersson in central Stockholm and repaired foreign-made telephones. In 1878 Ericsson began making and selling his own telephone equipment. His telephones were not technically innovative. In 1878 he made an agreement to supply telephones and switchboards to Sweden's first telecommunications operating company, Stockholms Allmänna Telefonaktiebolag. Also in 1878, local telephone importer Numa Peterson hired Ericsson to adjust some telephones from the Bell Telephone Company. He bought a number of Siemens telephones and analyzed the technology; Ericsson had a scholarship at Siemens a few years earlier. He was familiar with Bell and Siemens Halske telephones through his firm's repair work for Telegrafverket and Swedish State Railways. He improved these designs to produce a higher-quality instrument to be used by new telephone companies such as Rikstelefon to provide cheaper service than the Bell Group. Ericsson had no patent or royalty problems because Bell had not patented their inventions in Scandinavia. His training as an instrument maker was reflected in the standard of finish and the ornate design of Ericsson telephones of this period. At the end of the year he started to manufacture telephones much like those of Siemens; the first product was finished in 1879. Ericsson became a major supplier of telephone equipment to Scandinavia. Its factory could not keep up with demand; joinery and metal-plating were contracted out. Much of its raw materials were imported; in the following decades Ericsson bought into a number of firms to ensure supplies of brass, wire, ebonite, and magnet steel. Much of the walnut wood used for cabinets was imported from the United States. The prices of Bell equipment and services led Henrik Tore Cedergren to form an independent telephone company called Stockholms Allmänna Telefonaktiebolag in 1883. As Bell would not deliver equipment to competitors, he formed a pact with Ericsson to supply the equipment for his new telephone network. In 1918 the companies were merged into Allmänna Telefonaktiebolaget LM Ericsson. In 1884, a multiple-switchboard manual telephone exchange was mostly copied from a design by C. E. Scribner at Western Electric. This was legal because the device was not patented in Sweden, although in the United States it had held patent 529421 since 1879. A single switchboard could handle up to 10,000 lines. The following year, LM Ericsson and Cedergren toured the United States, visiting several telephone exchange stations to gather "inspiration". They found U.S. switchboard designs were more advanced but Ericsson telephones were equal to others. In 1884, a technician named Anton Avén at Stockholms Allmänna Telefonaktiebolag combined the earpiece and the mouthpiece of a standard telephone into a handset. It was used by operators in the exchanges where operators needed to have one hand free when talking to customers. Ericsson picked up this invention and incorporated it into Ericsson products, beginning with a telephone named The Dachshund. As production grew in the late 1890s, and the Swedish market seemed to be reaching saturation, Ericsson expanded into foreign markets through a number of agents. 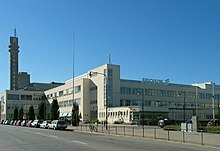 The UK (Ericsson Telephones Ltd.) and Russia were early markets, where factories were later established improve the chances of gaining local contracts and to augment the output of the Swedish factory. In the UK, the National Telephone Company was a major customer; by 1897 sold 28% of its output in the UK. The Nordic countries were also Ericsson customers; they were encouraged by the growth of telephone services in Sweden. Other countries and colonies were exposed to Ericsson products through the influence of their parent countries. These included Australia and New Zealand, which by the late 1890s were Ericsson's largest non-European markets. Mass production techniques now firmly established; telephones were losing some of their ornate finish and decoration. Despite their successes elsewhere, Ericsson did not make significant sales into the United States. The Bell Group, Kellogg and Automatic Electric dominated the market. Ericsson eventually sold its U.S. assets. Sales in Mexico led to inroads into South American countries. South Africa and China were also generating significant sales. With his company now multinational, Lars Ericsson stepped down from the company in 1901. Ericsson ignored the growth of automatic telephony in the United States and concentrated on manual exchange designs. 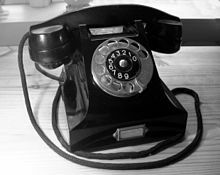 Their first dial telephone was produced in 1921, although sales of the early automatic switching systems were slow until the equipment had proven itself on the world's markets. Telephones of this period had a simpler design and finish, and many of the early automatic desk telephones in Ericsson's catalogues were magneto styles with a dial on the front and appropriate changes to the electronics. Elaborate decals decorated the cases. World War I, the subsequent Great Depression, and the loss of its Russian assets after the Revolution slowed the company's development while sales to other countries fell by about half. The acquisition of other telecommunications companies put pressure on Ericsson's finances; in 1925, Karl Fredric Wincrantz took control of the company by acquiring most of the shares. Wincrantz was partly funded by Ivar Kreuger, an international financier. The company was renamed Telefon AB LM Ericsson. Kreuger started showing interest in the company, being a major owner of Wincrantz holding companies. In 1928, Ericsson began issuing "A" and "B" shares; an "A" share had 1000 votes against a "B" share. Wincrantz controlled the company by having only a few "A" shares, not a majority of the shares. The company raised more money by issuing a lot of "B" shares, while maintaining the status quo of power distribution. In 1930, a second issue of "B"-shares took place, and Kreuger gained majority control of the company with a mixture of "A" and "B" shares he bought with money lent by LM Ericsson, with security given in German state bonds. He then took a loan for his own company Kreuger & Toll from ITT Corporation (administered by Sosthenes Behn), giving parts of LM Ericsson as security, and used its assets and name in a series of international financial dealings. Ericsson was now regarded by ITT as a takeover target as its main international competitor. In 1931, ITT acquired enough shares from Kreuger to have a majority interest in Ericsson. This news was not made public for some time because of a government-imposed limit on foreign shareholdings in Swedish companies, so the shares were still listed in Kreuger's name. Kreuger in return gained shares in ITT; he stood to make a profit of $11 million[clarification needed] on the deal. When ITT's Behn wanted to cancel this deal in 1932, he discovered there was no money left in the company, just a large claim on the same Kreuger & Toll that Kreuger had himself lent money to. Kreuger had effectively bought LM Ericsson with its own money. Kreuger had been using the company as security for loans; despite his profits he unable to repay them. Ericsson found they had invested in some doubtful share deals, whose losses were deemed significant. ITT examined the deal and found it had been misled about Ericsson's value. ITT asked Kreuger to go to New York City for a conference, but he did not attend. As word of Kreuger's financial position spread, the banking institutions pressured him to provide security for his loans. ITT canceled the deal to buy Ericsson shares. Kreuger could not repay the $11 million, and committed suicide in Paris in 1932. ITT owned one third of Ericsson, but was forbidden to exercise this ownership because of a paragraph in the company's articles of association stating that no foreign investor was allowed to control more than 20% of the votes. Ericsson was saved from bankruptcy and closure with the help of banks including Stockholms Enskilda Bank (now Skandinaviska Enskilda Banken) and other Swedish investment banks controlled by the Wallenberg family, and some Swedish government backing. Marcus Wallenberg Jr. negotiated a deal with several Swedish banks to rebuild Ericsson financially. The banks gradually increased their possession of LM Ericsson "A" shares, while ITT was still the largest shareholder. In 1960, the Wallenberg family arranged with ITT to buy its shares in Ericsson, and has since controlled the company. The Ericsson DBH1001 (1931) was the first combined telephone set with a housing and handset made from Bakelite. The design is attributed to Jean Heiberg. In the 1920s and 1930s, the world telephone markets were being organized and stabilized by many governments. The fragmented town-by-town systems serviced by small, private companies that had evolved were integrated and offered for lease to a single company. Ericsson obtained some leases, which represented further sales of equipment to the growing networks. Ericsson got almost one third of its sales under the control of its telephone operating companies. Negotiations between the major telephone companies aimed at dividing up the world between them. The size of ITT made it hard to compete with. Ericsson reduced its involvement in telephone operating companies and went back to manufacturing telephones and switchgear. The Beeston factory in the UK had been a joint venture between Ericsson and the National Telephone Company. The factory built automatic switching equipment for the GPO under license from Strowger, and exported products to former UK colonies. The UK government divided its equipment contracts between competing manufacturers, but Ericsson's presence and manufacturing facilities in the UK allowed it to get most of the contracts. Sales drives resumed after the Great Depression, but the company never achieved the market penetration that it had at the turn of the century. It still produced a range of telephones and switching equipment; the latter was becoming a more important part of its range. 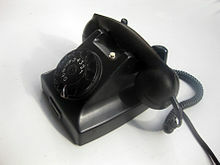 The distinctive Ericsson styles became subdued by the increasing use of bakelite telephones starting in the 1930s. Ericsson introduced the world's first fully automatic mobile telephone system, MTA, in 1956. It released one of the world's first hands-free speaker telephones in the 1960s. In 1954, it released the Ericofon. Ericsson crossbar switching equipment was used in telephone administrations in many countries. In 1983 the company introduced the ERIPAX suite of network products and services. In the 1990s, during the emergence of the Internet, Ericsson was regarded as slow to realize its potential and falling behind in the area of IP technology. But the company had established an Internet project in 1995 called Infocom Systems to exploit opportunities leading from fixed-line telecom and IT. 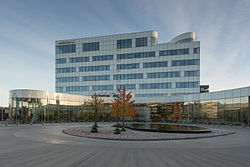 CEO Lars Ramqvist wrote in the 1996 annual report that in all three of its business areas – Mobile Telephones and Terminals, Mobile Systems, and Infocom Systems – "we will expand our operations as they relate to customer service and Internet Protocol (IP) access (Internet and intranet access)". The growth of GSM, which became a de facto world standard, combined with Ericsson's other mobile standards, such as D-AMPS and PDC, meant that by the start of 1997, Ericsson had an estimated 40% share of the world's mobile market, with around 54 million subscribers. There were also around 188 million AXE lines in place or on order in 117 countries. Telecom and chip companies worked in the 1990s to provide Internet access over mobile telephones. Early versions such as Wireless Application Protocol (WAP) used packet data over the existing GSM network, in a form known as GPRS (General Packet Radio Service), but these services, known as 2.5G, were fairly rudimentary and did not achieve much mass-market success. The International Telecommunication Union (ITU) had prepared the specifications for a 3G mobile service that included several technologies. Ericsson pushed hard for the WCDMA (wideband CDMA) form based on the GSM standard, and began testing it in 1996. Japanese operator NTT DoCoMo signed deals to partner with Ericsson and Nokia, who came together in 1997 to support WCDMA over rival standards. DoCoMo was the first operator with a live 3G network, using its own version of WCDMA called FOMA. Ericsson was a significant developer of the WCDMA version of GSM, while US-based chip developer Qualcomm promoted the alternative system CDMA2000, building on the popularity of CDMA in the US market. This resulted in a patent infringement lawsuit that was resolved in March 1999 when the two companies agreed to pay each other royalties for the use of their respective technologies and Ericsson purchased Qualcomm's wireless infrastructure business and some R&D resources. Once the Qualcomm conflict was settled, Ericsson continued to be involved in mobile Internet. It announced a partnership with Microsoft to combine its web browser and server software with Ericsson's mobile Internet technologies. The subsequent joint venture was dissolved in 2001 in the aftermath of the Internet and telecom crashes. Ericsson got caught up in the Dot-com bubble of the late 1990s. The company's market value increased; its share price peaked at SEK 825 in March 2000, from a low of SEK 20 at the start of the 1990s. Lars Ramqvist resigned as CEO in January 1998, and later became chairperson of the board. Sven-Christer Nilsson took over as CEO in early 1998, and led the company in a clearer IP direction. Under his leadership, the company's acquisitions including a share in US router company Juniper. Ericsson had become a leading player in networks and the production of mobile telephones, sharing top place with Nokia and Motorola during 1997. Services were becoming increasingly important; Ericsson had offered network rollout services for many years, and had operated networks, but at the end of the 1990s the services operations were amalgamated into a services unit. In June 1999, Kurt Hellström, the head of Ericsson's mobile division, replaced Nilsson as CEO. Worldwide hype around the potential of the internet – and for Ericsson in particular the mobile internet – had inflated industry expectations. Operators in many Westernized countries used much of their capital bidding for 3G licenses, and could not afford the new networks required to use the spectrum they had acquired. The order intake that Ericsson and other telecom vendors had expected, and invested in preparing for, was disappointing, causing job losses and consolidations across the industry. Ericsson issued a profit warning in March 2001. Over the coming year, sales to operators halved. Mobile telephones became a burden; the company's telephones unit made a loss of SEK 24 million in 2000. A fire in a Philips chip factory in New Mexico in March 2000 caused severe disruption to Ericsson's phone production, dealing a coup de grâce to Ericsson's mobile phone hopes. Mobile phones would be spun off into a joint venture with Sony, Sony Ericsson Mobile Communications, in October 2001. Ericsson launched several rounds of restructuring, refinancing and job-cutting; during 2001, staff numbers fell from 107,000 to 85,000. A further 20,000 went the next year, and 11,000 more in 2003. A new rights issue raised SEK 30 billion to keep the company afloat. The company had survived as mobile Internet started growing. With record profits, it was in better shape than many of its competitors. Ericsson's position as a supplier of GSM equipment to many major operators, and its pioneering role in the emerging 3G standards and associated technology, placed it at the forefront of many of the changes to come. The cutbacks that followed 10 consecutive quarters of losses meant the company could return to profit in Q3 2003, and begin to grow again. After announcing in 2003 that it had returned to growth, new CEO Carl-Henric Svanberg said the company was to concentrate on operational excellence, a wide-ranging push for efficiency and better return on investment that dominated Ericsson's corporate culture for several years. During the cutbacks, Ericsson had reduced its CDMA organization. This standard, used largely in North America, Japan and mainland Asia, was a rival to GSM, and Ericsson had a global market share of 25%, but the overall volumes were too low so Ericsson wound down its CDMA commitment, ending it completely by 2006. Ericsson started a series of acquisitions to strengthen its position in key technologies and market segments. The first of these was Marconi, a company dating back to the dawn of radio whose assets included a strong portfolio in transmission, fiber optic and fixed network services. Further acquisitions included Redback Networks (carrier edge-routers), Entrisphere (fiber) and LHS Telekommunikation (customer care services) in 2007, and Tandberg Television in 2008. Ericsson sold its enterprise PBX division to Aastra Technologies the same year. Ericsson re-entered the CDMA market after acquiring North American vendor Nortel's CDMA operations and assets in 2009. The acquisitions followed Ericsson's general strategy of expanding into next-generation network technologies and multimedia, a combined offering that became more important as video became the dominant form of data traffic on mobile broadband networks.40% of the world's mobile traffic is carried over Ericsson networks. Ericsson created a division to develop its multimedia business in early 2007. Ericsson was working on ways to improve WCDMA as operators were buying and rolling it out; it was the first generation of 3G access. New advances included IMS (IP Multimedia Subsystem) and the next evolution of WCDMA, called High-Speed Packet Access (HSPA). It was initially deployed in the download version called HSDPA; the technology spread from the first test calls in the US in late 2005 to 59 commercial networks in September 2006. HSPA would provide the world's first mobile broadband. In July 2016, Hans Vestberg stepped down as Ericsson's CEO after heading the company for six years. Jan Frykhammar, who has been working for the company since 1991 will be stepping in as interim CEO as Ericsson searches for a full-time replacement. On 16 January 2017, following Ericsson's announcement on 26 October 2016, new CEO Börje Ekholm started and interim CEO Jan Frykhammar stepped down the following day. Around 2000, companies and governments began to push for standards for mobile Internet. In May 2000, the European Commission created the Wireless Strategic Initiative, a consortium of four telecommunications suppliers in Europe – Ericsson, Nokia, Alcatel (France), and Siemens AG (Germany) – to develop and test new prototypes for advanced wireless communications systems. Later that year, the consortium partners invited other companies to join them in a Wireless World Research Forum in 2001. In December 1999, Microsoft and Ericsson announced a strategic partnership to combine the former's web browser and server software with the latter's mobile-internet technologies. In 2000, the Dot-com bubble burst with marked economic implications for Sweden. Ericsson, the world's largest producer of mobile telecommunications equipment, shed thousands of jobs, as did the country's Internet consulting firms and dot-com start-ups. In the same year, Intel, the world's largest semiconductor chip manufacturer, signed a $1.5 billion deal to supply flash memory to Ericsson over the next three years. The short-lived joint venture called Ericsson Microsoft Mobile Venture AB, owned 70/30 percent by Ericsson and Microsoft, respectively, ended in October 2001 when Ericsson announced it would absorb the former joint venture and adopt a licensing agreement with Microsoft instead. The same month, Ericsson announced the launch of Sony Ericsson, a joint venture mobile telephone business, together with Sony Corporation. Sony Ericsson remained in operation until February 2012, when Sony bought out Ericsson's share; Ericsson said it wanted to focus on the global wireless market as a whole. In September 2001, Ericsson purchased the remaining shares in EHPT from Hewlett Packard. Founded in 1993, Ericsson Hewlett Packard Telecom (EHPT) was a joint venture made up of 60% Ericsson interests and 40% Hewlett-Packard interests. In 2002, ICT investor losses topped $2 trillion and share prices fell by 95% until August that year. More than half a million people lost their jobs in the global telecom industry over the two years. The collapse of U.S. carrier WorldCom, with more than $107 billion in assets, was the biggest in U.S. history. The sector's problems caused bankruptcies and job losses, and led to changes in the leadership of a number of major companies. Ericsson made 20,000 more staff redundant and raised about $3 billion from its shareholders. In June 2002, Infineon Technologies AG (then the sixth-largest semiconductor supplier and a subsidiary of Siemens) bought Ericsson's microelectronics unit for $400 million. Co-operation with Hewlett-Packard did not end with EHPT; in 2003 Ericsson outsourced its IT to HP, which included Managed Services, Help Desk Support, Data Center Operations, and HP Utility Data Center. The contract was extended in 2008. There have also been a number of joint Ericsson/HP Telecoms outsourcing deals with telecoms operators including H3G and Vodafone. In October 2005, Ericsson acquired the bulk of the troubled UK telecommunications manufacturer Marconi Company, including its brand name that dates back to the creation of the original Marconi Company by the "father of radio" Guglielmo Marconi. In September 2006, Ericsson sold the greater part of its defense business Ericsson Microwave Systems, which mainly produced sensor and radar systems, to Saab AB, which renamed the company to Saab Microwave Systems. The sale meant Saab Ericsson Space, previously a joint venture, was now fully owned by Saab. Not included in the sale to Saab was the National Security & Public Safety division, which was transferred to Ericsson with the sale. In 2007, Ericsson acquired carrier edge-router maker Redback Networks, and then Entrisphere, a US-based company providing fiber-access technology. In September 2007, Ericsson acquired an 84% interest in German customer-care and billing software firm LHS, a stake later raised to 100%. In 2008, Ericsson sold its enterprise PBX division to Aastra Technologies, and acquired Tandberg Television, the television technology division of Norwegian company Tandberg. In 2009, Ericsson bought the CDMA2000 and LTE business of Nortel’s carrier networks division for US$1.18 billion; Bizitek, a Turkish business support systems integrator; the Estonian manufacturing operations of electronic manufacturing company Elcoteq; and completed its acquisition of LHS. Acquisitions in 2010 included assets from the Strategy and Technology Group of inCode, a North American business and consulting-services company; Nortel's majority shareholding (50% plus one share) in LG-Nortel, a joint venture between LG Electronics and Nortel Networks providing sales, R&D and industrial capacity in South Korea, now known as Ericsson-LG; further Nortel carrier-division assets, relating from Nortel's GSM business in the United States and Canada; Optimi Corporation, a U.S.–Spanish telecommunications vendor specializing in network optimization and management; and Pride, a consulting and systems-integration company operating in Italy. In 2011, Ericsson acquired manufacturing and research facilities, and staff from the Guangdong Nortel Telecommunication Equipment Company (GDNT) as well as Nortel's Multiservice Switch business. It also formed a strategic alliance with Akamai Technologies to develop and market mobile cloud acceleration services. Ericsson acquired U.S. company Telcordia Technologies in January 2012, an operations and business support systems (OSS/BSS) company. In March, Ericsson announced it was buying the broadcast-services division of Technicolor, a media broadcast technology company. In April 2012 Ericsson completed the acquisition of BelAir Networks a strong Wi-Fi network technology company. On 3 May 2013, Ericsson announced it would divest its power cable operations to Danish company NKT Holding. On 1 July 2013, Ericsson announced it would acquire the media management company Red Bee Media, subject to regulatory approval. The acquisition was completed on 9 May 2014. In September 2013, Ericsson completed its acquisition of Microsoft's Mediaroom business and televisions services, originally announced in April the same year. The acquisition makes Ericsson the largest provider of IPTV and multi-screen services in the world, by market share; it was renamed Ericsson Mediaroom. In September 2014, Ericsson acquired majority stake in Apcera for cloud policy compliance. In October 2015, Ericsson completed the acquisition of Envivio, a software encoding company. On 20 June 2017, Bloomberg disclosed that Ericsson hired Morgan Stanley to explore the sale of its media businesses. The Red Bee Media business was kept in-house as an independent subsidiary company, as no suitable buyer was found, but a 51% stake of the remainder of the Media Solution division was sold to private equity firm One Equity Partners, the new company being named MediaKind. The transaction was completed on 31 January 2019. In February 2018, Ericsson acquired the location-based mobile data management platform Placecast. Ericsson has since integrated Placecast's platform and capabilities with its programmatic mobile ad subsidiary, Emodo. In May 2018, SoftBank partnered with Ericsson to trial new radio technology. As of 2016[update], members of the board of directors of LM Ericsson were: Leif Johansson, Jacob Wallenberg, Kristin S. Rinne, Helena Stjernholm, Sukhinder Singh Cassidy, Börje Ekholm, Ulf J. Johansson, Mikael Lännqvist, Zlatko Hadzic, Kjell-Åke Soting, Nora Denzel, Kristin Skogen Lund, Pehr Claesson, Karin Åberg and Roger Svensson. Ericsson has structured its R&D in three levels depending on when products or technologies will be introduced to customers and users. Its research and development organization is part of Group Function Technology and addresses several facets of network architecture: wireless access networks; radio access technologies; broadband technologies; packet technologies; multimedia technologies; services software; EMF safety and sustainability; security; and global services. The head of research since 2012 is Sara Mazur. Group Function Technology holds research co-operations with several major universities and research institutes including: Lund University in Sweden, Eötvös Loránd University in Hungary and Beijing Institute of Technology in China. Ericsson also holds research co-operations within several European research programs such as GigaWam and OASE. Ericsson holds 33,000 granted patents, and is the number-one holder of GSM/GPRS/EDGE, WCDMA/HSPA, and LTE essential patents. Ericsson hosts a developer program called Ericsson Developer Connection designed to encourage development of applications and services. Ericsson also has an open innovation initiative for beta applications and beta API's & tools called Ericsson Labs. The company hosts several internal innovation competitions among its employees. Ericsson's business includes technology research, development, network and software development, and running and evolving operations. and software Ericsson offers end-to-end services for all major mobile communication standards, and has four main business units. Business Unit Networks has been headed by Johan Wibergh since 2008. It develops network infrastructure for communication needs over mobile and fixed connections. As of 1 July 2014, BNET has been divided into Business Unit Radio and Business Unit Cloud & IP. Its products include radio base stations, radio network controllers, mobile switching centers and service application nodes. Operators use Ericsson products to migrate from 2G to 3G and, most recently, to 4G networks. The company's network division has been described as a driver in the development of 2G, 3G, 4G/LTE technology, future 5G and the evolution towards all-IP, and it develops and deploys advanced LTE systems, but it is still developing the older GSM, WCDMA, and CDMA technologies. The company's networks portfolio also includes core networks, microwave transport, Internet Protocol (IP) networks, fixed-access services for copper and fiber, and mobile broadband modules, several levels of fixed broadband access, radio access networks from small pico cells to high-capacity macro cells, controllers for radio base stations, and core network nodes that interconnect radio access networks with other parts of the network. Ericsson Power Modules supplies direct current (DC)/DC converters and DC/DC regulators, mainly to the communications industry, for advanced applications, such as multiplexors, switches, routers and radio base stations. Manufacturing is in China. Since 2010, Magnus Mandersson has been head of Business Unit Global Services. It provides telecoms-related managed services, including taking responsibility for running an operator's network and the related business support systems. The unit is active in 180 countries; it supplies managed services, systems integration, consulting, network rollout, design and optimization, broadcast services, learning services and support. The company also works with television and media, public safety, and utilities. Ericsson claims to manage networks that serve more than 1 billion subscribers worldwide, and to support customer networks that serve more than 2.5 billion subscribers. Per Borgklint has headed Business Unit Support Solutions since 2011. Initially established in 2007, as Business Unit Multimedia, Ericsson announced a new strategy for its multimedia business in February 2012. Its Business Unit Support Solutions now develops software for operations and business support systems (OSS and BSS), real-time, multi-screen and on-demand television and media, and for the emerging m-commerce eco-system. Ericsson claims a leading position in charging and billing, serving 1.6 billion people. OSS and BSS expanded after the integration of Telcordia, and it focuses on Customer experience management including fulfilment, assurance, network optimization and real-time charging. TV and media offers products that enable operators and content owners to sell multi-screen TV services. M-Commerce sells mobile e-commerce products, for mobile operators and financial institutions offer mobile wallet services to consumers. Ericsson has announced m-commerce deals with Western Union and African wireless carrier MTN. Ericsson's network rollout services employ in-house capabilities, subcontractors and central resources to make changes to live networks. Services such as technology deployment, network transformation, and network optimization are also provided. Ericsson's Broadcast Services deal with the playout of live and pre-recorded, commercial and public service television programmes, including presentation (continuity announcements), trailers, and ancillary access services such as closed-caption subtitles, audio description and in-vision sign language interpreters. Its media management services consist of Managed Media Preparation and Managed Media Internet Delivery. As of 7 May 2014, Robert Puskaric assumed the role as vice president and head of Business Unit Modems, succeeding Mats Norin who had the position since August 2013. This unit designs and sells LTE multimode thin modems, including 2G, 3G and 4G interoperability. This activity was transferred to Ericsson from ST-Ericsson when the new Modems organization was put in place. The unit has developed products including the Ericsson M7000 series multimode modems which support LTE (FDD /TDD), HSPA+, HSPA, TD-SCDMA and EDGE. In September 2014, Ericsson announced it would stop developing modems, shutting a loss-making unit it took on after joint venture partner STMicroelectronics pulled out. Sony Ericsson Mobile Communications AB (Sony Ericsson) was a joint venture with Sony that merged the previous mobile telephone operations of both companies. 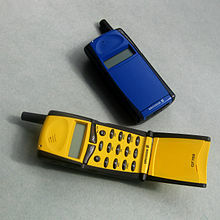 It manufactured mobile telephones, accessories and personal computer (PC) cards. Sony Ericsson was responsible for product design and development, marketing, sales, distribution and customer services. On 16 February 2012, Sony announced it had completed the full acquisition of Sony Ericsson. 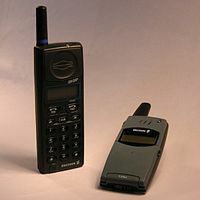 As a joint venture with Sony, Ericsson's mobile telephone production was moved into the company Sony Ericsson in 2001. The following is a list of mobile phones marketed under the brand name Ericsson. Ericsson A2618 & Ericsson A2628 – Dualband cellphones. Use graphical LCD display based on PCF8548 I²C controller. Ericsson T28 – Very slim telephone. Uses lithium polymer batteries. Ericsson T28 FAQ use graphical LCD display based on PCF8558 I²C controller. Ericsson Mobile Platforms was a supplier of technology platforms for GSM/EDGE and WCDMA/HSPA platforms used in devices, such as mobile handsets and PC cards. Through Ericsson Mobile Platforms, Ericsson licensed open-standard, end-to-end interoperability-tested GSM/EDGE and WCDMA technology platforms. The product offering included reference designs, platform software, application-specific integrated circuit (ASIC) designs and development boards, development and test tools, training, support and documentation. Ericsson Mobile Platforms had operations at nine global locations, with main operations in Sweden. The company existed for eight years; on 12 February 2009, Ericsson announced it would be merged with the mobile platform company of STMicroelectronics, ST-NXP Wireless, to create a 50/50 joint venture owned by Ericsson and STMicroelectronics. This joint venture was divested in 2013 and remaining activities can be found in Ericsson Modems and STMicroelectronics. Ericsson Mobile Platform ceased being a legal entity early 2009. Starting in 1983 Ericsson Enterprise provided communications systems and services for businesses, public entities and educational institutions. It produced products for voice over Internet protocol (VoIP)-based private branch exchanges (PBX), wireless local area networks (WLAN), and mobile intranets. Ericsson Enterprise operated mainly from Sweden but also operated through regional units and other partners/distributors. In 2008 it was sold to Aastra. Ericsson was an official backer in the launch of the .mobi top level domain created specifically for the mobile internet. Since the launch of .mobi in September 2006, Ericsson has launched SonyEricsson.mobi, the mobile portal of Sony Ericsson. ^ a b c d e "Fourth quarter and full-year report 2018" (PDF). ericsson.com. Retrieved 23 February 2019. ^ a b "Company facts". Ericsson.com. Ericsson AB. Retrieved 29 July 2018. ^ a b c d e f g "Start". Ericsson History. Retrieved 11 November 2016. ^ "About us". Ericsson.com. Ericsson AB. Retrieved 5 November 2016. ^ "Patents and licensing". Ericsson.com. Ericsson AB. Retrieved 31 December 2016. ^ "Ericsson Cradles". Bobs Phones Page. Retrieved 1 September 2016. ^ "1931". Ericsson.com. 30 August 2016. Retrieved 18 January 2019. ^ "Ericsson Celebrates 50 Years of Mobile Telephony". Cellular-news.com. 17 October 2006. Retrieved 9 October 2011. ^ "The Internet and the New World". History of Ericsson. ^ a b "Annual Report 1996" (PDF). Ericsson. ^ Gohring, Nancy (29 March 1999). "Ericsson/Qualcomm bitter feud ends". Connected Planet. Archived from the original on 9 January 2014. ^ "Short Take: Qualcomm, Ericsson finalize CDMA agreement". CNET. Archived from the original on 18 October 2017. ^ "Microsoft, Ericsson announce strategic partnership to drive mobile Internet market". Mobic.com. ^ "Shareholder Information – Share Graphs and Figures". Ericsson. Archived from the original on 14 July 2014. Retrieved 7 July 2014. ^ "Ericsson Stake in Juniper". The New York Times. 18 March 1999. ^ "Problems with Mobile Phones". History of Ericsson. ^ "Crisis". History of Ericsson. ^ Mukherjee, Amit S. (1 October 2008). "The Fire That Changed an Industry: A Case Study on Thriving in a Networked World". FT Press. ^ "Sony Ericsson Mobile Communications established today - Ericsson". News.cision.com. 1 October 2001. Retrieved 11 November 2016. ^ Svenolof Karlsson; Anders Lugn. "The first cutbacks". Ericsson History. Retrieved 11 November 2016. ^ Svenolof Karlsson; Anders Lugn. "Second round of cuts". Ericsson History. Retrieved 11 November 2016. ^ Svenolof Karlsson; Anders Lugn. "A new chairman of the board". Ericsson History. Retrieved 11 November 2016. ^ Svenolof Karlsson; Anders Lugn. "Record profits". Ericsson History. Retrieved 11 November 2016. ^ Pike, Rebecca (17 March 2003). "Business | Italians pick up first 3G mobile phones". BBC News. Retrieved 11 November 2016. ^ "Technology | 3G goes live in the UK". BBC News. 3 March 2003. Retrieved 11 November 2016. ^ "Acquisition of Marconi". Ericsson. 9 May 2006. Retrieved 1 September 2017. ^ "Aastra Technologies to acquire Ericsson's Enterprise Communication Business" (Press release). Aastra. 18 February 2008. Archived from the original on 4 July 2014. Retrieved 18 February 2008. ^ "Ericsson to divest its enterprise PBX solutions to Aastra Technologies" (Press release). Ericsson. 18 February 2008. Archived from the original on 20 December 2008. Retrieved 7 November 2008. ^ "About Ericsson - Corporate Information". Ericsson.com. ^ "Cingular HSDPA Test Successful". Phone Scoop. 4 January 2005. Retrieved 11 November 2016. ^ "HSDPA performance and evolution". Ericsson. Retrieved 11 November 2016. ^ Brian Heater, TechCrunch. "Ericsson's CEO steps down as the company begins search for a replacement." 25 July 2016. 25 July 2016. ^ Ericsson AB. "Ericsson's Board names Börje Ekholm new President and CEO." 26 October 2016. 26 October 2016. ^ Treasury Civil Penalty information "https://www.treasury.gov/resource-center/sanctions/CivPen/Documents/20180606_ericsson.pdf"
^ "WSI (Wireless Strategic Initiative)" (PDF). Ericsson.se. 1 May 2000. Archived from the original (PDF) on 20 October 2017. ^ InfoWorld. InfoWorld Media Group, Inc. p. 77-IA1. Retrieved 17 December 2018. ^ "Microsoft, Ericsson Team Up to Bring Information Anytime Anywhere, to Carriers and Consumers". Microsoft.com. 8 December 1999. Archived from the original on 2 August 2012. Retrieved 20 June 2012. ^ "Intel scores flash memory deal with Ericsson". cnet.com. 4 February 2000. Retrieved 20 June 2012. ^ "Microsoft pulls out of mobile JV with Ericsson". Itworld.com. 5 October 2001. Retrieved 20 June 2012. ^ "Ericsson – press release Sony Ericsson Mobile Communications established today". Ericsson.com. 1 October 2001. Archived from the original on 9 February 2002. Retrieved 20 June 2012. ^ "Sony to acquire Ericsson's share of Sony Ericsson– Press release". Ericsson.com. 27 October 2011. Retrieved 20 July 2012. ^ "Sony Completes Full Acquisition of Sony Ericsson – Press release". Sonymobile.com. 16 February 2012. Archived from the original on 31 May 2012. Retrieved 20 July 2012. ^ "Ericsson acquires Hewlett-Packard's remaining interest in EHPT". News Powered by Cision. Retrieved 28 February 2017. ^ Bidault, F. (2012). Managing Joint Innovation: How to Balance Trust and Control in Strategic Alliances. Palgrave Macmillan. p. 64. ISBN 978-0-230-27997-1. Retrieved 17 December 2018. ^ "Inside the Telecom Game - How a small group of insiders made billions as the industry collapsed". Businessweek.com. 5 August 2002. Archived from the original on 22 August 2011. Retrieved 21 June 2012. ^ Beltran, Luisa (22 July 2002). "WorldCom files largest bankruptcy ever". Money.cnn.com. Retrieved 21 June 2012. ^ Tran, Mark (22 April 2002). "Ericsson axes 17,000 jobs". London: Guardian.co.uk. Retrieved 21 June 2012. ^ "Infineon Buys Ericsson Microelectronics". Lightreading.com. 12 June 2002. Retrieved 21 June 2012. ^ "HP News - HP Signs Contract with Ericsson for Global IT Outsourcing Services". Ssl.www8.hp.com. Retrieved 11 November 2016. ^ "Ericsson to buy most of Marconi for $2.1B". InfoWorld.com. 25 October 2005. Retrieved 21 June 2012. ^ "Saab Acquires Ericsson Microwave Systems". Defense Industry Daily. 13 June 2006. Retrieved 21 June 2012. ^ "Ericsson to buy Redback for $2.1 billion". Networkworld.com. 20 December 2006. Archived from the original on 1 May 2013. Retrieved 21 June 2012. ^ "All shares in LHS acquired – Press release". Ericsson.com. 20 February 2010. Retrieved 21 June 2012. ^ "Ericsson to divest its enterprise PBX solutions to Aastra Technologies – Press Release". Ericsson.com. 18 February 2008. Retrieved 22 February 2016. ^ "Ericsson announces cash offer to acquire Tandberg Television– Press release". Ericsson.com. 26 February 2007. Retrieved 21 June 2012. ^ "Ericsson to acquire majority of Nortel's North American wireless business – Press release". Ericsson.com. 25 July 2009. Retrieved 21 June 2012. ^ "Ericsson to acquire Elcoteq's operations in Tallinn to secure manufacturing capacity in Estonia – Press release". Ericsson.com. 17 June 2009. Retrieved 21 June 2012. ^ "Ericsson Expands Strategy and technology consulting capabilities – Press release". Ericsson.com. 7 September 2010. Retrieved 20 July 2012. ^ "Ericsson Takes Ownership of Optimi Corporation". Technews.com. 22 December 2010. Retrieved 20 July 2012. ^ "Ericsson closes the Acquisition of GDNT, China – Press release". Ericsson.com. 12 May 2011. Retrieved 20 July 2012. ^ "Ericsson Buys Nortel's Multi Service Switch Businesses". Cellular-news.com. 25 September 2010. Retrieved 20 July 2012. ^ "Ericsson closes Telcordia acquisition– Press release". Ericsson.com. 12 January 2012. Retrieved 20 July 2012. ^ Rahn, Cornelius (14 June 2011). "Ericsson to Buy Telcordia for $1.2 Billion to Add Services". Bloomberg. Retrieved 9 October 2011. ^ BroadBandTechReport. "Ericsson Completes BelAir Buy." 2 April 2016. Retrieved 17 August 2017. ^ "divests its power cable operation to NKT Cables". Ericsson. 3 May 2013. Retrieved 11 November 2016. ^ "Ericsson to acquire leading media services company Red Bee Media" (Press release). Ericsson. 1 July 2013. Retrieved 1 July 2013. ^ "Ericsson completes acquisition of Red Bee Media" (Press release). Ericsson. 12 May 2014. Retrieved 15 May 2014. ^ "Ericsson closes acquisition of Microsoft Mediaroom" (Press release). Ericsson. 5 September 2013. Retrieved 3 October 2013. ^ "Ericsson acquires majority stake in Apcera for cloud policy compliance" (Press release). PCWorld. 22 September 2014. Retrieved 22 September 2014. ^ "Ericsson completes acquisition of Envivio". Ericsson.com. 27 October 2015. Retrieved 19 April 2019. ^ "Ericsson Hires Banks to Explore Sale of Media Businesses". 20 June 2017 – via www.bloomberg.com. ^ "Ericsson completes divestment of majority stake in MediaKind". Ericsson.com. 1 February 2019. Retrieved 19 April 2019. ^ "Ericsson buys Placecast for ad geotargeting". Mobile Marketer. Retrieved 27 December 2018. ^ Murison, Malek (17 May 2018). "SoftBank, Ericsson bring machine learning to mobile network design | Internet of Business". Internet of Business. Retrieved 23 May 2018. ^ "Board of Directors". Ericsson. Retrieved 1 July 2016. ^ Ashworth, Tony. "Reducing plastic waste in India". Ericsson.com. Retrieved 29 August 2018. ^ a b "Our Research Areas". Ericsson. Retrieved 11 November 2016. ^ "Business and innovation". Lund University. Retrieved 11 November 2016. ^ "Early Career Program | Students & Young Professionals | Ericsson Careers". Ericsson. Archived from the original on 28 April 2015. Retrieved 11 November 2016. ^ "Patents". Ericsson. 5 November 2016. Retrieved 11 November 2016. ^ "About our developer program". Ericsson. Archived from the original on 31 December 2010. Retrieved 9 October 2011. ^ "To Boost Internal Innovation, Ericsson Thinks Inside The Boxes". Fast Company. 16 April 2013. Retrieved 18 September 2018. ^ "To Boost Internal Innovation, Ericsson Thinks Inside The Boxes". Fast Company. 16 April 2013. Retrieved 16 January 2018. ^ "Self Organizing Networks". YouTube. 4 October 2012. ^ Cheng, Roger (12 March 2012). "How Ericsson is a resource for app developers". CNET. ^ Degrasse, Martha (6 November 2013). "Ericsson's role in Sprint Spark should not be underestimated". RCR Wireless News. ^ a b "Our Businesses". Ericsson.com. Archived from the original on 22 October 2014. Retrieved 19 October 2014. ^ "New business unit structure to support networks growth". Ericsson.com. Retrieved 19 October 2014. ^ "LTE Radio Access Network". Ericsson. 5 November 2016. Retrieved 11 November 2016. ^ Roberto Sabella. "Network Architecture Evolution: towards all-IP" (PDF). Q2s.ntnu.no. Archived from the original (PDF) on 24 September 2015. Retrieved 11 November 2016. ^ "LTE Radio Access Network". Ericsson. 5 November 2016. Archived from the original on 28 April 2015. Retrieved 11 November 2016. ^ "GSM Radio Access Network". Ericsson. 24 October 2016. Retrieved 11 November 2016. ^ "GSM still making a difference". Ericsson. Retrieved 11 November 2016. ^ "Ericsson white paper Introduction to IMS" (PDF). Facweb.iitkgp.ernet.in. Archived from the original (PDF) on 20 October 2017. Retrieved 11 November 2016. ^ "Power Modules". Ericsson. 20 September 2016. Retrieved 11 November 2016. ^ a b "Management". Ericsson. Retrieved 11 November 2016. ^ "Managed Services". Ericsson. 12 September 2016. Archived from the original on 26 June 2014. Retrieved 11 November 2016. ^ "Academy - training and consulting for the telecom and ICT industry". Ericsson. Retrieved 11 November 2016. ^ "Learning Services". Ericsson. 11 August 2016. Retrieved 11 November 2016. ^ "Support". Ericsson. Retrieved 11 November 2016. ^ "outlines strategy for its multimedia business". Ericsson. Retrieved 11 November 2016. ^ Ben-Aaron, Diana (21 February 2012). "Ericsson Forms Support Business Unit Around Billing Systems". Bloomberg. ^ "Ericsson Boards Its Own BUSS". Light Reading. Retrieved 6 March 2012. ^ "Ericsson Teams With Western Union". Light Reading. Retrieved 6 March 2012. ^ "Ericsson Announces New M-Commerce Portfolio". TelecomsTech. Retrieved 6 March 2012. ^ Mawad, Marie (28 February 2012). "Ericsson Turns To Mobile Wallet Amid Short-Term Uncertainty". Bloomberg. Retrieved 6 March 2012. ^ "Ericsson Announces MCommerce Deals, Picocell And In-Building Products". Mobile Europe. Archived from the original on 29 February 2012. Retrieved 6 March 2012. ^ "Network Roll-Out". Ericsson. 13 October 2016. Retrieved 11 November 2016. ^ "Ericsson". Ericsson. 9 September 2013. Retrieved 11 November 2016. ^ "Ericsson". Ericsson.com. Retrieved 19 October 2014. ^ "Ericsson". Ericsson. Retrieved 11 November 2016. ^ "Ericsson to shut modem business, 1,000 jobs to go". Reuters. 18 September 2006. Retrieved 18 September 2014. ^ "Sony Completes Full Acquisition of Sony Ericsson Sony to Rename the Company Sony Mobile Communications and Accelerate Business Integration". Retrieved 23 November 2016 – via sony.net. ^ "Ericsson_lcd". Module.ro. Retrieved 9 October 2011. ^ "ST-Ericsson born as wireless-semiconductor industry leader". Ericsson. 12 February 2009. Retrieved 11 November 2016. ^ "Bloomberg - Ericsson Mobile Platforms AB". www.bloomberg.com. Retrieved 9 December 2018. ^ "to divest its enterprise PBX solutions to Aastra Technologies". Ericsson. 18 February 2008. Retrieved 11 November 2016. John Meurling & Richard Jeans (1994) A switch in time: AXE — creating a foundation for the information age. London: Communications Week International. ISBN 0-9524031-1-0. John Meurling & Richard Jeans (2000). The Ericsson Chronicle: 125 years in telecommunications. Stockholm: Informationsförlaget. ISBN 91-7736-464-3. General reference to all chapters on the Ericsson history: "The History of Ericsson". Center for Business History, Stockholm, and Telefonaktiebolaget LM Ericsson.